You may clean your computer from many traces and links from your Internet activity that your computer stores in many places. You may include Internet activity cleaning into a large wipe and clean task. Go to the Setting a Large Wipe and Clean Task section for details. 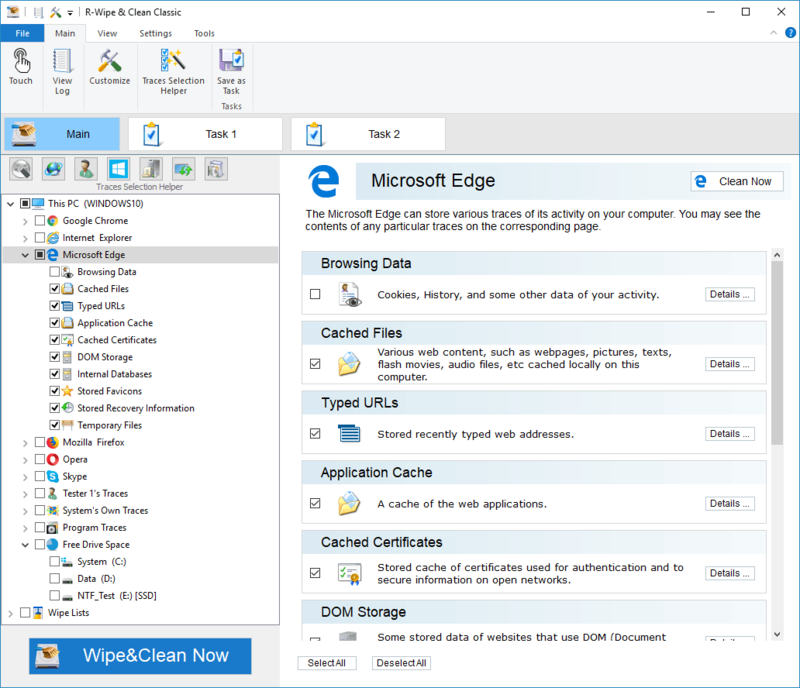 R-Wipe & Clean automatically detects most popular web browsers and shows them in its Tree . The list of items visible on each browser's panel can be edited on the Customize panel. • Select the required browser. The browser's panel appears in the right pane. Depending on the browser, the content of its panel may vary. • Select the required items and click the Clean Now button. The browser section may contain some critical items that may affect browser performance. R-Wipe & Clean will throw a warning about those items if you select the entire browser section. When R-Wipe & Clean finishes cleaning, the Report dialog box will appear showing cleaning results. The Microsoft Edge web browser keeps content, such as pictures, texts, flash movies, audio files, from all web pages you visited. The Microsoft Edge browser stores cookies (small files that web sites store on your computer for identification purposes), History, logs, etc. The Microsoft Edge browser can store URLs you typed in the address field. The Application Cache makes it possible for the system to access a web application without a network connection and to work with it faster. Your system stores a cache of Certification Revocation Lists (CRL), Certificate Trust Lists (CTL), Certificates, and other documents used to authenticate web site certificates. Some webpages can be implemented using the DOM (Document Object Module) technology. This list shows you web addresses of such webpages cached in your system. The Microsoft Edge web browser can store favicons of visited websites. The Microsoft Edge browser can store some information about the current session that can be used for recovery in case of an application crash. 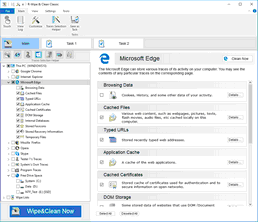 List of temporary files created by the Microsoft Edge web browser. Your system keeps content, such as pictures, texts, flash movies, audio files, of all web pages visited by you in the this folder. Cookies are small files that web sites store on your computer for identification purposes. You may keep cookies from your favorite sites. You may also see their content. You computer stores links to each web site visited by you in this folder. Web browsers store links to files you have downloaded from those browsers. Your computer stores URL addresses of most recently viewed pages. You can view them in the drop-down list of the address bar of your internet browser. Information you might enter when filling in web forms. Internet Explorer stores information about using its add-ons such as ActiveX controls, browser helper objects, or toolbars. Internet Explorer stores the order of Favorites menu items. When cleaning the tree, you do not remove Favorites menu, only its cached copy.